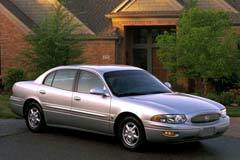 The Buick LeSabre sedan has proven very successful in the market thanks to having strong support among older customers. A used Buick LeSabre can be a good purchase thanks to its powerful V6 engine. The vehicle does handle well on the road and is known for safe performance. Some models were installed with an optional traction control further contributing to their safety. The trunk on these vehicles is huge making it perfect for those who like to travel. Automatic transmission further boosts the ability to easily drive the car on the road with a smooth ride. The interior of the vehicle is quite spacious. Certain models are able to comfortably house up to six passengers. For those looking for a fuel efficient vehicle the LeSabre does 27 mpg on the highway and 18 in the city.